Tweet Manookatoo Adventures: Why do we love cruisers? Our first cruising experience together was in 2004 - September school holidays. 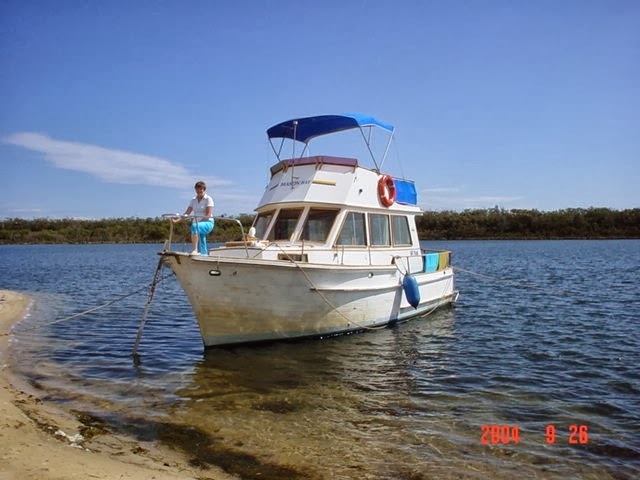 Neither of our teams were playing good enough footy for the finals to be interesting, the Bulls' Cruisers Hire company at Metung on the Gippsland Lakes had some good specials - so why not head away for a few days on the water? We hired the Mason Bay, a 30 foot clipper, loaded it up with supplies and headed out for adventures. 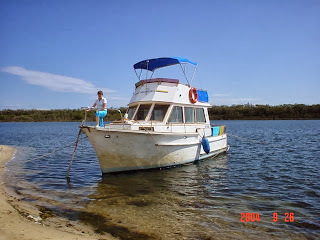 In five days we did a lot of cruising; from Nungurnah to Paynesville to Johnsonville, Bunga Arm to Sperm Whale Head to Boxers Creek, staying where the whim took us - a night each at Rotamah Island, Tambo River, Bunga Arm and Ocean Grange. We were really enjoying the relaxing ambience that time on the water provides and learning about all the joys of Clipper Cruising. The boat was old and tired, chugging across the water with little flair but affording us a level of comfort we hadn't experienced before - the opportunity to take "home" with you as you travelled. We were hooked on the idea of our own house on the water!! PS: we listened to the AFL grand final via a neighbouring yacht's radio - no idea who won! !